LCB is working tirelessly to embed a sustainable, community-led charity that delivers our mission and vision for the long term. Over the past four years we have actively engaged with thousands of people across South London, a vast majority of whom were previously inactive, marginalised or excluded members of their community. We believe that we do offer something for everyone, with no exception! Grant funding helps us to provide outreach activities to venues and participants on either a free-of-charge basis or heavily subsidised: see below for more details. Our gym, with disabled access, also offers a range of affordable memberships, pay-as-you-go options, concessionary rates and suggested-donation-only community classes. This enables us to offer social, sporting and recreational choices to everyone we engage via our outreach programme. We encourage participants to head down to Peckham and continue their training in whatever form they wish. Connect is a non-contact boxing programme in the LCB gym with an integrated emotional wellbeing offer for young men aged 11-18, funded by a three-year grant from Comic Relief. It builds on the strong partnership developed between In Your Corner (a clinical psychology led social enterprise www.facebook.com/iycboxing) and London Community Boxing during a successful 9 week pilot project in 2017, further enhanced by the addition of Southwark Council’s Children and Families Services. The project will comprise of three x13-week blocks each year, for three years. Connect targets young men who would benefit from support for their emotional wellbeing but whom clinic based services find it hard to engage. The project acknowledges the risks for young men growing up in South London, particularly challenges to staying safe in the community, remaining engaged in education or activity, and physical and emotional wellbeing. The project uses evidence based ideas from psychological intervention, and delivers these flexibly alongside non-contact boxing skills in group settings. The first began on September 18th 2018. The 2-hour, weekly sessions are delivered by an experienced boxing coach, senior clinical psychologist, and an assistant psychologist. Young men are referred to the programme from a range of local agencies across health, social care, youth justice, and education. The objective of the programme is to improve physical and emotional wellbeing, while developing non-contact boxing skills and a sense of community and connectedness in participants. We have continued our sessions at Rockbourne Youth Club in Lewisham for young people with mental and physical disabilities for a fifth year running. These sessions are assisted by a graduate of the programme, who also volunteers with LCB, replacing a previous graduate in that role who has now moved on into employment. Thanks to funding from London Sport, we run a weekly session in our gym for young people between the ages of 14 and 16 years old. Learning skills through gameplaying and partner work, these sessions are designed to enable a wide variety of young people to try something new and learn skills while having fun, without the pressure of more technically demanding sessions that they may want to try later on. While we teach boxing skills in these sessions, we do so through use of fun games, while encouraging making friends and working together. This 30-week programme is open to all young people in the age range but targets those who may be inactive for various reasons — young people interested in sport but largely unmotivated and not ready for more advanced sessions; some who may be isolated, disengaged or isolated and who partners have identified as at risk as a result; or others who may not be reached by more mainstream offerings. The cost to the participant is £1 per session. We run four hours of non-contact boxing development sessions for young people under 16-years old each week at a cost per participant of £1. These popular, well-attended sessions have attracted a wide variety of participants from all parts of the community. For anyone wishing to compete, we run three one and a half hour sessions each week in our England Boxing affiliated amateur boxing club for under 16s and 3 two-hour sessions each week for 16 and over at a cost of £5 per week for each participant. We continued to run weekly sessions for local schools, such as Harris Academy Peckham, and The Belham Primary School, Newlands Academy, St Martins and The London PE and School Sports Network (LPESSN). In partnership with South London Cares we run occasional Social Clubs, including a boxing fitness class, at the gym for The Elderly. Social clubs offer a chance for older people and their younger neighbours to share time, laughter and new experiences that help everyone to feel a part of our rapidly changing city, rather than left behind by it. 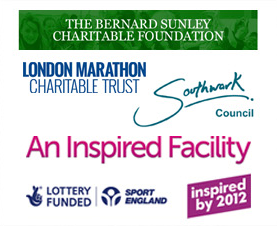 These are funded by South London Cares. In partnership with PDKinetics, we run weekly sessions for people with Parkinson’s. PDKinetics is an advanced movement programme that incorporates both physical and cognitive activity for people with Parkinson’s, affiliated with the University of East London. Its neuroactive programmes are designed specifically for the person with Parkinsons to help slow the progression of the condition whilst helping with balance, strength and coordination, helping increase participants’ confidence, fitness and wellbeing.